Nat Gould was descended from a family that had lived for generations at Pilsbury Grange in the upper valley of the river Dove, near Hartington in Derbyshire. 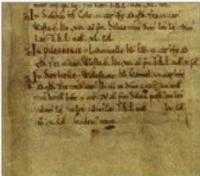 The first historical record of Pilsbury is in the Domesday Book compiled in 1086 after the Norman Conquest of Anglo-Saxon England. Pilsbury was described as wasta est, “it is waste”. It was destroyed, like the rest of the surrounding countryside, during the Harrying of the North, the campaign of deliberate destruction waged by William I.
Pilsbury was given by its Norman owner Robert de Ferrers, Earl of Derby, to Merevale Abbey near Atherstone in Warwickshire, founded by him in 1148. Merevale only ever had some ten monks. Lay brothers, who were ordinary farm workers, ran the sheep farm (or bercary) at Pilsbury, which was one of its most valuable possessions, providing an income for the abbey. After the dissolution of Merevale Abbey in the sixteenth century, Pilsbury Grange passed through several hands, but was eventually bought by Bess of Hardwick for the Cavendish family. Ownership was first passed on to her eldest son Henry, but later she transferred it to her second son William Cavendish, ancestor of the Earls (and from 1694 the Dukes) of Devonshire. The Goulds first came to Pilsbury Grange in 1684 when William Gould 1655-1725 took a lease from the Earl of Devonshire (1). 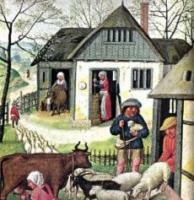 After the destruction of the monasteries, the sheep and wool trade was expanded by yeoman farmers such as the Gould family. Today the farmsteads among bleak Staffordshire moors seem remote, but in the 1600s they were highly productive and well connected to their markets (2). The descendants of the first Gould tenant of Pilsbury Grange remained farming there until 1901. (2) The richest market for English wool was in continental Europe. Wool went by packhorse trains across country to the river ports of Doncaster and Torksey. Vast herds of cattle were also on the move across the country. Although the Goulds were not directly involved in large scale cattle rearing and marketing, they could profit from this trade also. The ancient farm called Herbage in the Staffordshire moorlands between Leek and Longnor was the Gould family home for generations before William Gould 1655-1725 took his lease of Pilsbury Grange in 1684. Herbage lay on the Great Drove Road from the Cheshire plain over the moorlands to the Trent valley. Drovers needed overnight stops for the cattle and themselves, and Herbage was exactly the sort of place to provide them. The South-West Peak : History of the Landscape Eric Wood (2007) pages 52 to 54. Herbage itself and the pre-Pilsbury history of the Gould family have been extensively researched by Michael and Ann Hanson.